Chicken, Cheddar and Broccoli…one of my favorite combinations. 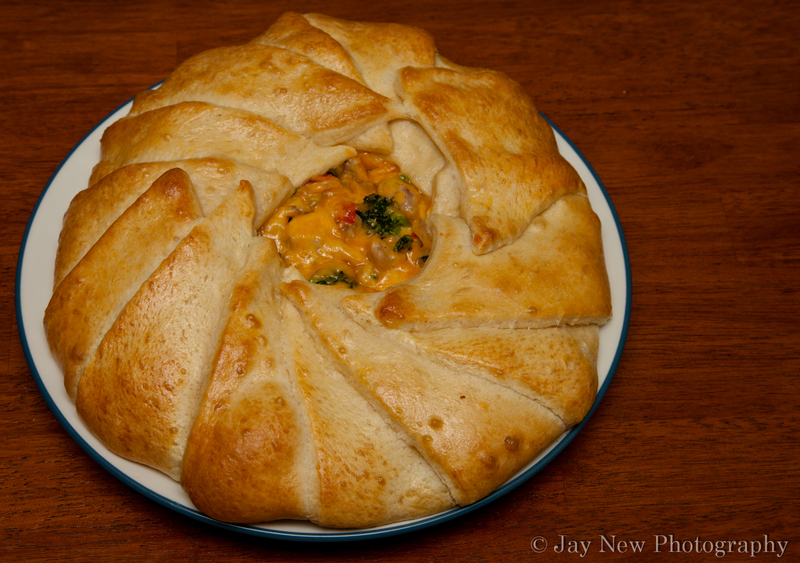 When I was in college, one of my favorite frozen foods was Chicken with broccoli and cheese stuffed inside. It was delicious…and expensive..especially since it was so addicting. I wanted to do a different take on this and adding a few extras inside. I used crescent dough, to make the crust (I didn’t have time to make puff pastry) and baked this to a golden brown. It is a beautiful dish to look at and tasted even better. Remove from heat and add mayonnaise and broccoli. Place chicken filling in the center of the circle. Sprinkle cheese over the filling. Starting with the last croissant triangle you placed on the circle, fold over the outer portion of the triangle over the filling, towards the center. Welcome back! This is one of Hubster’s favorite dishes, we used chicken breast and puff pastry 🙂 Pics look fantastic! Thank you! You should be receiving a package soon 🙂 It went out yesterday afternoon! It was a great vacation! I even was able to go in the pool. I love going to Florida! I love broccoli and I love cheddar and what happens when you combine them together? Warm, gooey, deliciousness lol. I think that will be my new word from now on. As always you never cease to surprise me with your wonderful recipes girl :). Oh and today’s post is all about chocolate :D.. thought you’d want to know that since we are in choco-holics anonymous lol. Very kewl! Hope you are doing well!